How Should you Respond to a Defective Income Tax Return Notice? How to Respond to a Defective Return Notice? It is natural to make a mistake or two when you do something you don’t do often or are not used to doing – like filing income tax returns. Sometimes we may miss entering certain information. Sometimes there could be an error. 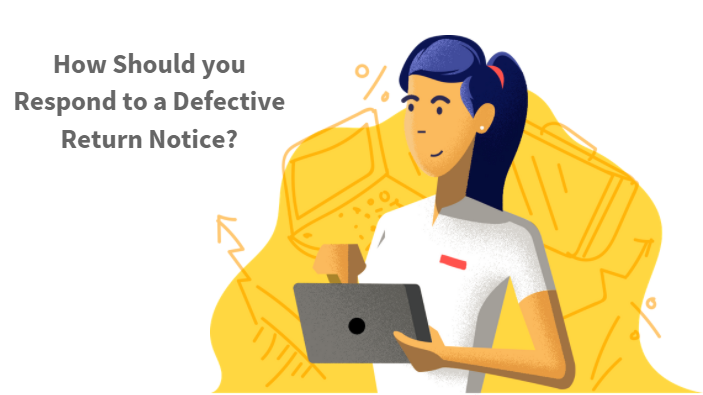 In such cases, you will get a defective notice as per Section 139(9) to rectify them. These mistakes, if not rectified in time, can lead to not-so-pleasant repercussions. In this article, we shall talk about what happens in case of a defective return notice issued by the IT Department. a. When you have filled up details of taxes paid, but have not provided income details, the Income Tax Department deems it defective. b. A notice for defective return is sent when tax deducted has been claimed as a refund, but no income details are provided in the return. c. The Department sends you a notice for defective return under Section 139(9) when you haven’t paid your taxes in full. d. When you are required to maintain a balance sheet and profit and loss statement but haven’t attached them with your income tax return, the tax return is declared defective. e. The name mentioned on the income tax return does not match with the name on the PAN card. You must revise your return addressing the defects the Income Tax Department has pointed out within 15 days from the receipt of intimation order under section 139(9). You can seek an extension by writing to your local Assessing Officer if you fail to revise your income tax return within 15 days. a. Choose the Assessment Year and download the ITR Form the Income Tax Department website. b. On the income tax return, select the option “In response to a notice under Section 139(9) where the original return filed was a defective return. c. Enter the communication reference number, available on the notice, and acknowledgment number and date of filing original return. d. Complete the income tax return like you normally would. f. Select “e-File in response to notice u/s 139(9)” under the “e-File” section and upload the rectified XML using the password mentioned in the notice. g. A confirmation message with an acknowledgment number appears on the Department on successful upload. In a nutshell, responding to a defective return notice is not time-consuming anymore like earlier thanks to the technological advancements. If you choose to file your returns with Cleartax, not only is the process quick, but we will also ensure that you do it in an error-free manner. Do not miss the D-day – 31st July. How to download your e-Aadhaar card ?